1. What are two examples of food insecurity identified in this movie? What were some of the ways in which the individuals involved coped with their predicament? Were they successful? Why or why not? In the movie they were two families were affected by food insecurity in the United States. Rosie family had jobs, but they were only paid just a little amount of money. Her mother was only getting paid $120 in every two weeks. Rosie always distracted in school because she’s always starving and all she’s thinking about is anything that involve food. Rosie town is very supportive at each other the pastor at their local church have a food program on Monday every week and the teacher also are helping they brought bags of foods to give to the children. The other family that is affected by food insecurity lived in Philadelphia. Barbie has two kids and she just lost her job earlier that year. She wasn’t receiving any income while having to take care of her two kids. she’s relying on the food stamps for food which is sometimes not enough for them. However, she doesn’t want to give up and eventually she found a people that has the same case as her and she was given the chance to speak to the White House to address the food insecurity in U.S. In Canada i feel that the aboriginals are at most risk of experiencing food insecurity. Ever since the start Canadians have treated the aboriginals poorly by taking away their land and making it difficult for them to farm. Today most aboriginals live in land reserves and receive minimal help from the government. The government basically just said “Here’s some land, now you guys are on your own”. The limited land may result to food shortages if there are too many mouths to feed in the future and it is up to the government to decide whether to help them or not. 3. What is your personal reaction to this movie? Did you have any preexisting ideas about food insecurity? Were you surprised by some of the information that was presented? Why or why not? I think that this documentary is an eye-opening and has very important message to be shared. It’s so easy to become complacent and not even realize the struggles that the other people are going thru all around you.. I knew partially about the struggles of food insecurity, but i wasn’t aware of how bad it really was. The part that made me more surprised is that the government sees these problems occurring, but continues to be oblivious to the real issues that are reoccurring with these programs. 4. If you were in a position to directly or indirectly influence the issue at hand (such as a politician or policy maker) what would you do to help? What policies do you think could aid those that are hungry? OR What is a way that you could make a difference today? How would you go about making that difference and change? If I was in a position where I could influence the issue I would start a plan that could help them a lot.. my plan would be to ensure that the people who are at risk of going hungry get proper support. I would raise the maximum annual income for getting government support and I would create a better service for people who are unemployed or employed with low income. I would create this better service by increasing the amount of food stamps given to people, and I would make the program easier to take part in. lastly, i would increase their minimum wages so that people can pay what their supposed to pay and have enough money to buy food. 1, why did you choose this lab? 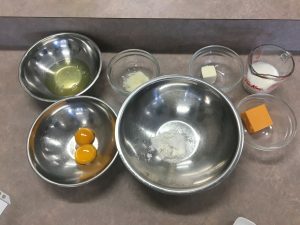 I choose this lab because i enjoyed this the most and its really easy to make at your house. You can make this one in 30 minutes and its not that flavorful but i really like it because i really like anything that has egg cause i find it delicious. 2, Did you enjoyed this lab? i really enjoyed doing this lab because there is nothing much to do and you can do any others stuff while doing it. You can do any others stuff while waiting for it to be cooked. 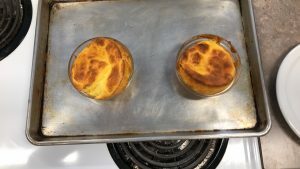 i enjoyed it because i have never made Cheese Souffle before and i think its delicious. 3, Did your product turn out the way you had hoped? If yes, what helped? If no, why did it not? Our product turn out the way that me and my team hoped it would look like and the one we made actually look better than the rest of the other group so i was proud because its the first time that we made this and we did great to make it. our group work well together in this lab because we finish it really fast and everyone in the group is doing what they are supposed to be doing. 5, If you were to do this lab again, what might you do differently? Why? 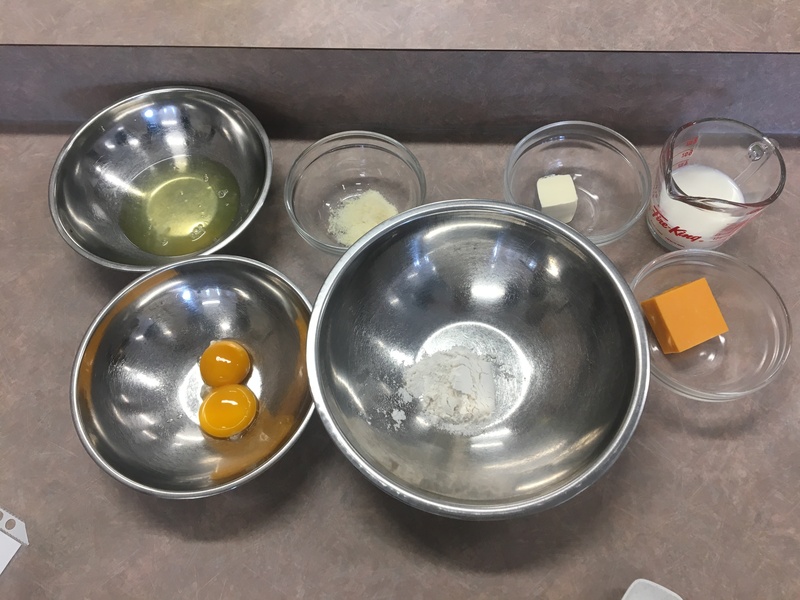 if i were to do this lab again what i could do differently is i can put a different stuff in it because during this lab we experimented it we try to put a pepper in the cheese souffle before we ate it. what i can try to put this time is i can put a a little bit salt in it before we put it on the oven because its not very flavorful but i liked it i just want to try it with different stuff in it.